Lake Geneva Hotel Opened in March 2014, Lake Geneva Hotel in Versoix is set on the lake shore and features a restaurant serving traditional and seasonal cuisine, as well as free WiFi access and rooms with an air cooling system. Each room comes with a flat-screen satellite TV, a desk, bay windows with a bench, and a bathroom with hairdryer, free toiletries, shower or bath tub. Genève Cottage price per day from € 73 After several months of restoration, this 18th-century historical building 12 km north of Geneva now houses comfortable and spacious rooms and suites equipped with up-to-date technologies. Each room or suite illustrates an aspect of Geneva and features a minibar, a safe, a microwave and free wireless internet access also covering the entire hotel area, even the garden..
Lake Geneva Hotel price per day from CHF 119 . Hôtel des Balances price per day from CHF 110 This traditional, family-run hotel in the centre of Versoix is just 30 metres from Lake Geneva and 10 km from Geneva. In winter, an ice rink is right outside Hôtel des Balances. Versoix Train Station is 500 metres away from the Balances Hôtel. Ski resort Blonay, recommended ski resort for beginners. 60 km from town of Versoix. 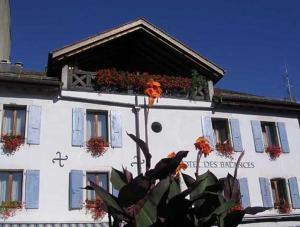 Ski resort Bourg-St-Pierre, recommended ski resort for experts. 89 km from town of Versoix. Ski resort Anzère, very good nightlife, many restaurants and pubs. 95 km from town of Versoix.